There’s something I’ve been wanting to try for a long time in this blog but didn’t have the chance to until now. So from today onwards and from this particular post, I will be attempting to make entries for all if not most of my merchandise experiences. This way my future self can look at these records about a couple of years from now and altogether avoid asking where funds have been allocated to. Haha, that was a joke. 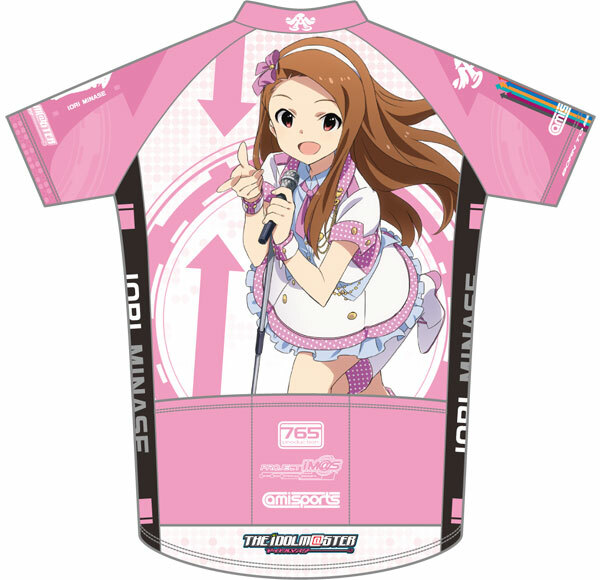 Getting back to the main topic, what we have today is THE IDOLM@STER – Iori Minase Cycling Jersey (Short Sleeve) / 『THE IDOLM＠STER』水瀬伊織サイクルジャージ (半袖), part of Amiami’s set of products that are geared towards sporting (and by that I mean biking, at least for now) activities called Amisports. As part of the Idolm@ster set (excluding the cycling shorts), there are a total of 28 products, one for each unique idol color (Ami’s and Mami’s count as one) times two versions of the same shirt with sleeve length variations. There’s also a price difference between the short and long sleeve versions which is pretty considerable. Long sleeve version is about 1800 JPY more expensive than its shorter counterpart. I chose Iori’s version for OBVIOUS reasons and a short sleeve length for comfort while biking (yes, I actually do bike), but you probably know all of that already as well as the rest of the above. So let’s go with the not so obvious features. This is what it’s called when the back is a tad bit longer than the front. It’s not quite obvious from the promotional product image but considering that this is an attire to be worn when you’re in a bent-over position while cycling so this shouldn’t be a surprise. Back pockets Again with this being a cycling jersey, pockets are placed on the back as compared to the front to prevent spills (if you were to use this attire for sports cycling). For this particular shirt, there are three pockets, each sufficient enough to hold a sports bottle though the middle pocket seems to be a bit more spacious than the left and right pockets. The sleeve designs are actually kinda’ nice. They’re subtle but it adds a nice finishing touch to the overall motif. Both sleeves are emblazoned with the arrow in the darker rendition of the idol’s color. The left sleeve bears the idol’s silhouette, name, and the Idolmaster logo while the right bears the AMCG Angel Mark / AMCGエンジェルマーク, all the 765Pro idol’s colored arrows, and the Amisports logo on top of it. The material is 100% polyester which again is probably to be expected as it bears in mind the fact that cyclers sweat. One thing worth noting is that the shirt demonstrates some translucency. I found out about this when I was able to make out the shape of the coat hanger when it was inside the shirt. Probably not a problem but it might be some might try to put into consideration. So if you were looking to buy any of these shirts, I would immediately check Amiami.com immediately while supplies last because at the time of this writing, some of the shirts have already sold out. If that doesn’t work, you can look at other places too. I know for a fact that Amazon.co.jp also sells them so it might do you some good to check it out. Partnered with a pink cycling to Otakon and going downtown New Jersey to do an errand! MOST AWESOME FEELING EVER.